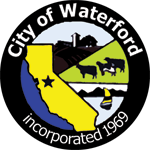 California Consulting LLC client City of Waterford Renews Contract - California Consulting, INC.
California Consulting is pleased to announce the City of Waterford has renewed their contract. Thank you for your continued confidence in our services. Waterford, California, in Stanislaus county, is 11 miles NE of Turlock, California and 65 miles E of San Jose, California. The city is included in the Modesto metropolitan area.Waterford City began to take shape in the second half of the nineteenth century. During that time, there was no bridge across the Tuolumne River and it could only be crossed by means of a ford on the waterfront. The community thusly came to be known as Waterford. California Consulting is the state’s largest grant writing firm that has successfully written over 670 application. Through combined efforts, California Consulting as secured over $1.5 billion dollars in federal, state, and private foundation funding for its clients.